A final so far removed from the Beautiful Game, so far out of keeping with such a largely upbeat tournament, was settled four minutes from the end of extra time by Andres Iniesta, so crowning Spain champions of the world for the first time. They had waited so long what was an extra half-hour? The preceding 116 minutes had been atrocious, as bad as the Italia 90 denouement and littered with bookings, with Howard Webb effortlessly eclipsing Romuald Arppi Filho’s record of six in the 1986 final. Holland were the worst offenders. Never mind the quality, feel the justice. Spain are worthy champions. A team so gloriously committed to playing the game the right way gain the ultimate reward. Spain pass and move, always accentuating the positive, always looking to stretch the boundaries of the game, always maintaining momentum. Even when struggling to storm the well-organised Dutch barricades, they kept going. In overcoming the obdurate Dutch, Spain earned their right to sporting immortality. In claiming the 2010 World Cup, Spain will also have made a wonderful case for hosting the 2018 competition. Their presentation will be simple: Spain is the home of the world and European champions, of the planet’s premier league and the place of Xavi, Iniesta and David Villa. And wise owls of the dig-out like Vicente del Bosque, a man determined to make history. History had been all around last night. An hour before kick-off, following a spectacular closing ceremony featuring the eclectic but electric combination of Shakira, three fighter planes and 13 automated elephants, Nelson Mandela was driven on to the pitch in a buggy. Resplendent in a Cossack hat, the great statesmen smiled and waved as Soccer City stood in emotional salute, chanting his name. Twenty years ago, Mandela, newly released from prison, had marched into the same arena, the then FNB Stadium, and declared “we are going forward’’. His beloved country has certainly taken another stride into the international limelight this past memorable month. Mandela’s people were out in force for this, sporting the kits and face-paints of Holland and Spain. Inevitably, the Spanish had been first to show in an opening half that sadly lost its way, looking to release David Villa through the middle or unleash overlapping full-backs, particularly Sergio Ramos down the right. The Real Madrid defender was soon fouled by Giovanni van Bronckhorst, gifting Spain a free-kick. Xavi, the little conductor of the grand orchestra, lifted in a ball met firmly by Ramos, whose downward header was athletically parried away by Maarten Stekelenburg. It was to prove one of the few highlights of a first half scarred by bad challenges, including one potential rib-breaker from Nigel de Jong. Facing a physical and technical challenge, the Spanish still sought to maintain their usual percussive rhythm, taking their possession game to Holland, who were slow neither in the robust tackle nor in coming forward. When Sergio Busquets dawdled, Dirk Kuyt nipped in, nicking the ball but his shot was too weak to alarm a keeper of the class of Iker Casillas. Back Spain came, Villa and Andrés Iniesta linking neatly around the box to send Ramos down the inside-right channel. Easily eluding Kuyt, Ramos drove the ball into the six-yard box where Johnny Heitinga cleared. From the ensuing corner, Xabi Alonso crossed to the far post where Villa met the ball on the volley but could find only the side-netting. Close but no cigarillo. Those expecting a masterclass of attacking football form both sides were being disappointed. For the rest of the half, it was essentially end-to-end fouls. Webb’s pen was in danger of running out of ink. English ref, physical game? It was sad to see even technical players stooping so low. Robin van Persie had already poleaxed Busquets and now set about Joan Capdevila, catching the Villarreal defender with a nasty challenge. Only Webb’s prompt action prevented it spilling over. Carles Puyol arrowed in on Arjen Robben’s ankle and followed Van Persie into the Rotherham referee’s book. Then Mark van Bommel, never shy in examining opponents’ shin-pads and mettle, clattered Iniesta from behind. Capdevilla, Xavi and Puyol immediately formed a debating society and petitioned Webb to ensure justice was done. It was. Van Bommel was cautioned. Spain were no angels. Ramos sent Kuyt crashing to earth and became the fourth name taken by Webb. The fifth was the worst offence, De Jong burrowing his boot into the chest of Alonso. Webb scribbled away, and brandished yellow but it should have been red. If Alonso wants acupuncture, there are better places to get it than De Jong’s boot. Football briefly reared its beautiful head when Pedro, preferred to Torres, shimmied forward, causing real concern in the orange ranks, but he placed his left-footed shot wide. Xavi started to get more on the ball, at one point turning to run at goal only to be baulked by Van Bommel. By fair means and foul play, Holland blocked Spain’s route to goal. Still the offences continued, Kuyt almost ripping Gerard Pique’s shirt off at a Spanish corner. Wesley Sneijder, hitherto anonymous, decided to stamp himself on Busquets, rather than the game, planting his studs in the midfielder’s thigh. As the half closed, the game suddenly opened up. Robben, cutting in on to his favourite left foot, brought a scrambling save from Casillas. Things could only get better, prayed the fans inside Soccer City, echoing sentiments of an estimated 700 million viewers worldwide. Spain enjoyed a wonderful chance as the second period got underway, Puyol flicking the ball on to the unmarked Cadevilla, but he miscued badly. Holland stirred, Robben again manoeuvring the ball on to his left foot and letting fly, again bringing a low save from Casillas. Unlike Robben, Sneijder was disappointing, soon giving the ball away. Still the challenges flew in, Van Bronckhorst ensuring Ramos did not get past him. Still the crime count continued to rise, Webb registering another caution. Webb must have felt as if he were back on the beat in Sheffield. And another…Heitinga brought to book for following through on Villa. Spain were then rescued by Casillas. Pique had only just returned after some treatment, following an accidental elbow from Kuyt, and the Barcelona centre-half reacted too sluggishly when Sneijder slid a ball through. Robben was through on goal, using his left foot to place the ball around Casillas but the keeper still managed to stretch out a leg and divert the ball to safety. Just. Holland had thrown an orange blanket across midfield and Spain needed to look wide. When Jesus Navas, having replaced Pedro, swept in a cross, Villa was found badly wanting. Spain’s No 7 then lofted a free-kick aimlessly over. Still Spain attempted to find a way through. Navas was making a difference, stretching Holland. Still chances fell Spain’s way. When Xavi hoisted in a corner the unmarked Ramos headed wastefully over. Iniesta almost found a path to goal but was brilliantly dispossessed by Sneijder. Holland were looking to soak up the pressure and hit on the break. When Van Persie flicked Stekelenburg’s long kick on, Robben was off and running, breaking through the middle, accelerating ahead of Puyol, who wrapped an arm around the flying Dutchman. Robben managed to escape but could not escape Casillas, who dived at his feet and again saved Spain. Extra-time was a slow lingering death. Opportunities came and were wasted. Spain screamed for a penalty when Heitinga caught Xavi. Then Stekelenburg saved from Cesc Fabregas. Nobody seemed prepared to score. Matijsen headed over. Jesus Navas’ shot deflected just wide off Navas. Some Olés, almost of relief, swirled around the ground when Iniesta nutmegged Robben. Then Fabregas glided through before poking his shot wide. Torres’ arrival for the second period of extra time was greeted with almost messianic fervour. 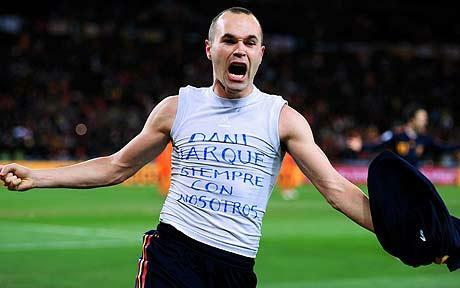 Heitinga, already cautioned, then pulled back Iniesta and walked, although Xavi was unable to make the free-kick count. Holland could have lost Robben for kicking the ball away but Webb showed leniency. And then nirvana. After all the dross, Iniesta pounced following good work by Torres and Fabregas.